Lola Versus which just released onto DVD and Blu-ray September 11, 2012 from, Twentieth Century Fox Home Entertainment. For the release there is a really cool checklist that you can print off. I am sure you are wondering what the checklist is. 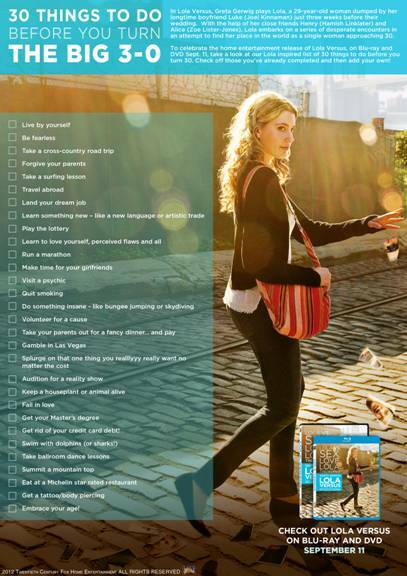 It is the 30 Before 30 Checklist, which can be used to help you in doing certain things almost like a bucket list. Since, this is an age that is only a few months away for me I can't help but be intrigued by what this checklist offers. Where to purchase: You are able to purchase Lola Versus from Amazon for $16.99.